Proprietary Name: Quetiapine Fumarate What is the Proprietary Name? Non-Proprietary Name: Quetiapine Fumarate What is the Non-Proprietary Name? Quetiapine Fumarate with NDC 70518-1909 is a a human prescription drug product labeled by Remedyrepack Inc.. The generic name of Quetiapine Fumarate is quetiapine fumarate. The product's dosage form is tablet, film coated and is administered via oral form. FDA Application Number: ANDA203359 What is the FDA Application Number? [see Use in Specific Populations (8.4)]. Quetiapine tablets can be taken with or without food. Day 1: 25 mg twice daily. Increase in increments of 25 mg to 50 mg divided two or three times on Days 2 and 3 to range of 300 to 400 mg by Day 4. Further adjustments can be made in increments of 25 to 50 mg twice a day, in intervals of not less than 2 days. Day 2: Twice daily dosing totaling 100 mg.
Day 3: Twice daily dosing totaling 200 mg.
Day 4: Twice daily dosing totaling 300 mg.
Day 5: Twice daily dosing totaling 400 mg.
Further adjustments should be in increments no greater than 100 mg/day within the recommended dose range of 400 to 800 mg/day. Based on response and tolerability, may be administered three times daily. Day 1: Twice daily dosing totaling 100 mg.
Day 2: Twice daily dosing totaling 200 mg.
Day 3: Twice daily dosing totaling 300 mg.
Day 4: Twice daily dosing totaling 400 mg.
Further dosage adjustments up to 800 mg/day by Day 6 should be in increments of no greater than 200 mg/day. Further adjustments should be in increments no greater than 100 mg/day within the recommended dose range of 400 to 600 mg/day. Administer once daily at bedtime. Administer twice daily totaling 400 to 800 mg/day as adjunct to lithium or divalproex. Generally, in the maintenance phase, patients continued on the same dose on which they were stabilized. ]. When indicated, dose escalation should be performed with caution in these patients. Elderly patients should be started on quetiapine 50 mg/day and the dose can be increased in increments of 50 mg/day depending on the clinical response and tolerability of the individual patient. Patients with hepatic impairment should be started on 25 mg/day. The dose should be increased daily in increments of 25 mg/day - 50 mg/day to an effective dose, depending on the clinical response and tolerability of the patient. Although there are no data to specifically address re-initiation of treatment, it is recommended that when restarting therapy of patients who have been off quetiapine for more than one week, the initial dosing schedule should be followed. When restarting patients who have been off quetiapine for less than one week, gradual dose escalation may not be required and the maintenance dose may be re-initiated. There are no systematically collected data to specifically address switching patients with schizophrenia from antipsychotics to quetiapine, or concerning concomitant administration with antipsychotics. While immediate discontinuation of the previous antipsychotic treatment may be acceptable for some patients with schizophrenia, more gradual discontinuation may be most appropriate for others. In all cases, the period of overlapping antipsychotic administration should be minimized. When switching patients with schizophrenia from depot antipsychotics, if medically appropriate, initiate quetiapine therapy in place of the next scheduled injection. The need for continuing existing EPS medication should be re-evaluated periodically. 25 mg tablets are peach colored, round, film coated tablets debossed with "F 71" on one side and plain on the other side.50 mg tablets are white colored, round, film coated tablets, debossed with "F 72" on one side and plain on the other side.100 mg tablets are yellow colored, round, film coated tablets debossed with "F 73" on one side and plain on the other side.200 mg tablets are white colored, round, film coated tablets debossed with "F 75" on one side and plain on the other side.300 mg tablets are white colored, capsule shaped, film coated tablets debossed with "F 76" on one\ side and plain on the other side.400 mg tablets are yellow colored, capsule shaped, film coated tablets debossed with "F 77" on one side and plain on the other side. Hypersensitivity to quetiapine or to any excipients in the quetiapine tablets formulation. Anaphylactic reactions have been reported in patients treated with quetiapine tablets. Elderly patients with dementia-related psychosis treated with antipsychotic drugs are at an increased risk of death. Analysis of 17 placebo-controlled trials (modal duration of 10 weeks), largely in patients taking atypical antipsychotic drugs, revealed a risk of death in drug-treated patients of between 1.6 to 1.7 times the risk of death in placebo-treated patients. 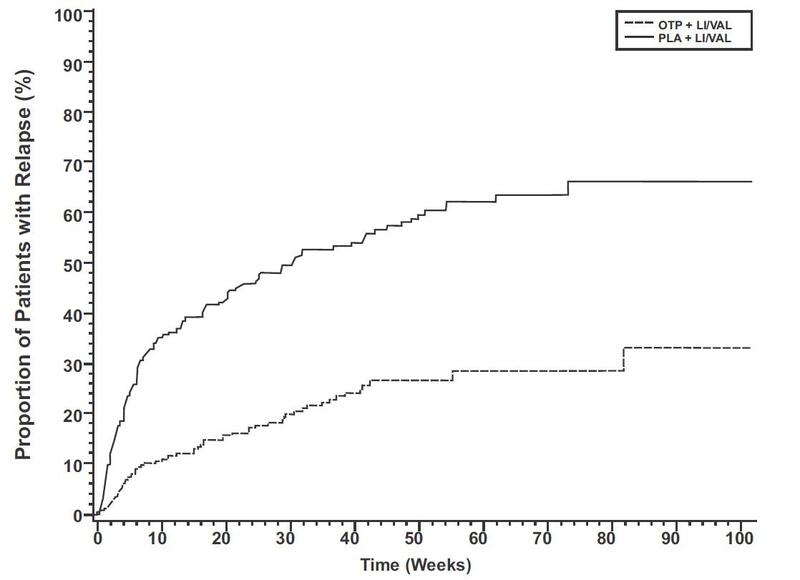 Over the course of a typical 10-week controlled trial, the rate of death in drug-treated patients was about 4.5%, compared to a rate of about 2.6% in the placebo group. Although the causes of death were varied, most of the deaths appeared to be either cardiovascular (e.g., heart failure, sudden death) or infectious (e.g., pneumonia) in nature. The pooled analyses of placebo-controlled trials in children and adolescents with MDD, obsessive-compulsive disorder (OCD), or other psychiatric disorders included a total of 24 short-term trials of 9 antidepressant drugs in over 4400 patients. The pooled analyses of placebo-controlled trials in adults with MDD or other psychiatric disorders included a total of 295 short-term trials (median duration of 2 months) of 11 antidepressant drugs in over 77,000 patients. There was considerable variation in risk of suicidality among drugs, but a tendency toward an increase in the younger patients for almost all drugs studied. There were differences in absolute risk of suicidality across the different indications, with the highest incidence in MDD. The risk differences (drug vs. placebo), however, were relatively stable within age strata and across indications. These risk differences (drug-placebo difference in the number of cases of suicidality per 1000 patients treated) are provided in Table 2. Families and caregivers of patients being treated with antidepressants for major depressive disorder or other indications, both psychiatric and nonpsychiatric, should be alerted about the need to monitor patients for the emergence of agitation, irritability, unusual changes in behavior, and the other symptoms described above, as well as the emergence of suicidality, and to report such symptoms immediately to healthcare providers. Such monitoring should include daily observation by families and caregivers. Prescriptions for quetiapine tablets should be written for the smallest quantity of tablets consistent with good patient management, in order to reduce the risk of overdose. Screening Patients for Bipolar Disorder: A major depressive episode may be the initial presentation of bipolar disorder. It is generally believed (though not established in controlled trials) that treating such an episode with an antidepressant alone may increase the likelihood of precipitation of a mixed/manic episode in patients at risk for bipolar disorder. Whether any of the symptoms described above represent such a conversion is unknown. However, prior to initiating treatment with an antidepressant, including quetiapine, patients with depressive symptoms should be adequately screened to determine if they are at risk for bipolar disorder; such screening should include a detailed psychiatric history, including a family history of suicide, bipolar disorder, and depression. A potentially fatal symptom complex sometimes referred to as Neuroleptic Malignant Syndrome (NMS) has been reported in association with administration of antipsychotic drugs, including quetiapine. Rare cases of NMS have been reported with quetiapine. Clinical manifestations of NMS are hyperpyrexia, muscle rigidity, altered mental status, and evidence of autonomic instability (irregular pulse or blood pressure, tachycardia, diaphoresis, and cardiac dysrhythmia). Additional signs may include elevated creatinine phosphokinase, myoglobinuria (rhabdomyolysis) and acute renal failure. In a 24-week trial (active-controlled, 115 patients treated with quetiapine) designed to evaluate glycemic status with oral glucose tolerance testing of all patients, at week 24 the incidence of a post-glucose challenge glucose level = 200 mg/dL was 1.7% and the incidence of a fasting blood glucose level = 126 mg/dL was 2.6%. The mean change in fasting glucose from baseline was 3.2 mg/dL and mean change in 2-hour glucose from baseline was -1.8 mg/dL for quetiapine. In a placebo-controlled quetiapine extended-release monotherapy study (8 weeks duration) of children and adolescent patients (10 – 17 years of age) with bipolar depression, in which efficacy was not established, the mean change in fasting glucose levels for quetiapine extended-release (n = 60) compared to placebo (n = 62) was 1.8 mg/dL versus 1.6 mg/dL. In this study, there were no patients in the quetiapine extended-release or placebo-treated groups with a baseline normal fasting glucose level (< 100 mg/dL) that had an increase in blood glucose level > 126 mg/dL. There was one patient in the quetiapine extended-release group with a baseline borderline fasting glucose level (> 100 mg/dL and < 126 mg/dL) who had an increase in blood glucose level of > 126 mg/dL compared to zero patients in the placebo group. Table 4 shows the percentage of adult patients with changes in total cholesterol, triglycerides, LDL-cholesterol and HDL-cholesterol from baseline by indication in clinical trials with quetiapine. 3. Parameters not measured in the quetiapine registration studies for schizophrenia. Children and Adolescents:Table 5 shows the percentage of children and adolescents with changes in total cholesterol, triglycerides, LDL-cholesterol and HDL-cholesterol from baseline in clinical trials with quetiapine. Table 5: Percentage of Children and Adolescents with Shifts in Total Cholesterol, Triglycerides, LDL-Cholesterol and HDL-Cholesterol from Baseline to Clinically Significant Levels. <40 mg/dL) from baseline to clinically significant levels were: total cholesterol 8% (7/83) for quetiapine extended-release vs. 6% (5/84) for placebo; triglycerides 28% (22/80) for quetiapine extended-release vs. 9% (7/82) for placebo; LDL-cholesterol 2% (2/86) for quetiapine extended-release vs. 4% (3/85) for placebo and HDL-cholesterol 20% (13/65) for quetiapine extended-release vs. 15% (11/74) for placebo. In clinical trials with quetiapine the following increases in weight have been reported. The mean change in body weight in the schizophrenia trial was 2.0 kg in the quetiapine group and -0.4 kg in the placebo group and in the bipolar mania trial, it was 1.7 kg in the quetiapine group and 0.4 kg in the placebo group. ≥ 7% of their body weight, not adjusted for normal growth. In order to adjust for normal growth over 26 weeks an increase of at least 0.5 standard deviation from baseline in BMI was used as a measure of a clinically significant change; 18.3% of patients on quetiapine met this criterion after 26 weeks of treatment. ≥7% of body weight at any time was 15% (14/92) for quetiapine extended-release vs. 10% (10/100) for placebo. The mean change in body weight was 1.4 kg in the quetiapine extended-release group vs. 0.6 kg in the placebo group. When treating pediatric patients with quetiapine for any indication, weight gain should be assessed against that expected for normal growth. A syndrome of potentially irreversible, involuntary, dyskinetic movements may develop in patients treated with antipsychotic drugs, including quetiapine. Although the prevalence of the syndrome appears to be highest among the elderly, especially elderly women, it is impossible to rely upon prevalence estimates to predict, at the inception of antipsychotic treatment, which patients are likely to develop the syndrome. Whether antipsychotic drug products differ in their potential to cause tardive dyskinesia is unknown. The risk of developing tardive dyskinesia and the likelihood that it will become irreversible are believed to increase as the duration of treatment and the total cumulative dose of antipsychotic drugs administered to the patient increase. However, the syndrome can develop, although much less commonly, after relatively brief treatment periods at low doses or may even arise after discontinuation of treatment. There is no known treatment for established cases of tardive dyskinesia, although the syndrome may remit, partially or completely, if antipsychotic treatment is withdrawn. Antipsychotic treatment, itself, however, may suppress (or partially suppress) the signs and symptoms of the syndrome and thereby may possibly mask the underlying process. The effect that symptomatic suppression has upon the long-term course of the syndrome is unknown. Given these considerations, quetiapine should be prescribed in a manner that is most likely to minimize the occurrence of tardive dyskinesia. Chronic antipsychotic treatment should generally be reserved for patients who appear to suffer from a chronic illness that (1) is known to respond to antipsychotic drugs, and (2) for whom alternative, equally effective, but potentially less harmful treatments are not available or appropriate. In patients who do require chronic treatment, the smallest dose and the shortest duration of treatment producing a satisfactory clinical response should be sought. The need for continued treatment should be reassessed periodically. If signs and symptoms of tardive dyskinesia appear in a patient on quetiapine, drug discontinuation should be considered. However, some patients may require treatment with quetiapine despite the presence of the syndrome. 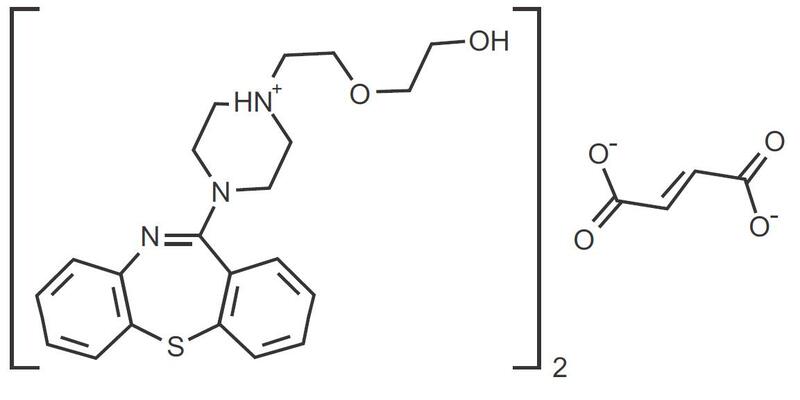 Quetiapine may induce orthostatic hypotension associated with dizziness, tachycardia and, in some patients, syncope, especially during the initial dose-titration period, probably reflecting its α1-adrenergic antagonist properties. Syncope was reported in 1% (28/3265) of the patients treated with quetiapine, compared with 0.2% (2/954) on placebo and about 0.4% (2/527) on active control drugs. Orthostatic hypotension, dizziness, and syncope may lead to falls. ]. If hypotension occurs during titration to the target dose, a return to the previous dose in the titration schedule is appropriate. Atypical antipsychotic drugs, including quetiapine, may cause somnolence, postural hypotension, motor and sensory instability, which may lead to falls and, consequently, fractures or other injuries. For patients with diseases, conditions, or medications that could exacerbate these effects, complete fall risk assessments when initiating antipsychotic treatment and recurrently for patients on long-term antipsychotic therapy. >10 mmHg) was 40.6% (136/335) for quetiapine and 24.5% (40/163) for placebo. In the 26-week open-label clinical trial, one child with a reported history of hypertension experienced a hypertensive crisis. Blood pressure in children and adolescents should be measured at the beginning of, and periodically during treatment. >10 mmHg) was 46.7% (43/92) for quetiapine extended-release and 36.0% (36/100) for placebo. In clinical trial and postmarketing experience, events of leukopenia/neutropenia have been reported temporally related to atypical antipsychotic agents, including quetiapine. Agranulocytosis has also been reported. fever, and should be managed as clinically appropriate. Possible risk factors for leukopenia/neutropenia include pre-existing low white cell count (WBC) and history of drug induced leukopenia/neutropenia. Patients with a pre-existing low WBC or a history of drug induced leukopenia/neutropenia should have their complete blood count (CBC) monitored frequently during the first few months of therapy and should discontinue quetiapine at the first sign of a decline in WBC in absence of other causative factors. Patients with neutropenia should be carefully monitored for fever or other symptoms or signs of infection and treated promptly if such symptoms or signs occur. Patients with severe neutropenia (absolute neutrophil count <1000/mm3) should discontinue quetiapine and have their WBC followed until recovery. Nonclinical Toxicology (13.2)]. Lens changes have also been observed in adults, children and adolescents during longterm quetiapine treatment, but a causal relationship to quetiapine use has not been established. Nevertheless, the possibility of lenticular changes cannot be excluded at this time. Therefore, examination of the lens by methods adequate to detect cataract formation, such as slit lamp exam or other appropriately sensitive methods, is recommended at initiation of treatment or shortly thereafter, and at 6-month intervals during chronic treatment. During clinical trials, seizures occurred in 0.5% (20/3490) of patients treated with quetiapine compared to 0.2% (2/954) on placebo and 0.7% (4/527) on active control drugs. As with other antipsychotics, quetiapine should be used cautiously in patients with a history of seizures or with conditions that potentially lower the seizure threshold, e.g., Alzheimer’s dementia. Conditions that lower the seizure threshold may be more prevalent in a population of 65 years or older. 4, in addition to clinical assessment, should be measured at baseline and at follow-up. About 0.7% (26/3489) of quetiapine patients did experience TSH increases in monotherapy studies. Some patients with TSH increases needed replacement thyroid treatment. 3(<0.8 LLN), 2.0% (26/1312), and increase in TSH, 4.9% (956/19412). In eight patients, where TBG was measured, levels of TBG were unchanged. Table 8 shows the incidence of these shifts in short term placebo-controlled clinical trials. 3 are defined as M0.8 x LLN (pmol/L) and shift in TSH is > 5 mlU/L at any time. 2. Includes quetiapine and quetiapine extended-release data. 3 are defined as <0.8 x LLN (pmol/L) and shift in TSH is >5 mlU/L at any time. 4 and TSH the shifts were 0.1% (7/6154) for quetiapine versus 0.0% (1/3007) for placebo. In acute placebo-controlled trials in children and adolescent patients with schizophrenia (6-week duration) or bipolar mania (3-week duration), the incidence of shifts for thyroid function values at any time for quetiapine treated patients and placebo-treated patients for elevated TSH was 2.9% (8/280) vs. 0.7% (1/138), respectively and for decreased total thyroxine was 2.8% (8/289) vs. 0% (0/145, respectively). Of the quetiapine treated patients with elevated TSH levels, 1 had simultaneous low free T4 level at end of treatment. Adults: During clinical trials with quetiapine, the incidence of shifts in prolactin levels to a clinically significant value occurred in 3.6% (158/4416) of patients treated with quetiapine compared to 2.6% (51/1968) on placebo. In acute placebo-controlled trials in children and adolescent patients with bipolar mania (3-week duration) or schizophrenia (6-week duration), the incidence of shifts in prolactin levels to a value (>20 µg/L males; > 26 µg/L females at any time) was 13.4% (18/134) for quetiapine compared to 4% (3/75) for placebo in males and 8.7% (9/104) for quetiapine compared to 0% (0/39) for placebo in females. 2 receptors, quetiapine elevates prolactin levels in some patients and the elevation may persist during chronic administration. Hyperprolactinemia, regardless of etiology, may suppress hypothalamic GnRH, resulting in reduced pituitary gonadotrophin secretion. This, in turn, may inhibit reproductive function by impairing gonadal steroidogenesis in both female and male patients. Galactorrhea, amenorrhea, gynecomastia, and impotence have been reported in patients receiving prolactin-elevating compounds. Long-standing hyperprolactinemia when associated with hypogonadism may lead to decreased bone density in both female and male subjects. Somnolence was a commonly reported adverse event reported in patients treated with quetiapine especially during the 3-5 day period of initial dose-titration. In schizophrenia trials, somnolence was reported in 18% (89/510) of patients on quetiapine compared to 11% (22/206) of placebo patients. In acute bipolar mania trials using quetiapine as monotherapy, somnolence was reported in 16% (34/209) of patients on quetiapine compared to 4% of placebo patients. In acute bipolar mania trials using quetiapine as adjunct therapy, somnolence was reported in 34% (66/196) of patients on quetiapine compared to 9% (19/203) of placebo patients. In bipolar depression trials, somnolence was reported in 57% (398/698) of patients on quetiapine compared to 15% (51/347) of placebo patients. Since quetiapine has the potential to impair judgment, thinking, or motor skills, patients should be cautioned about performing activities requiring mental alertness, such as operating a motor vehicle (including automobiles) or operating hazardous machinery until they are reasonably certain that quetiapine therapy does not affect them adversely. Somnolence may lead to falls. Although not reported with quetiapine, disruption of the body's ability to reduce core body temperature has been attributed to antipsychotic agents. 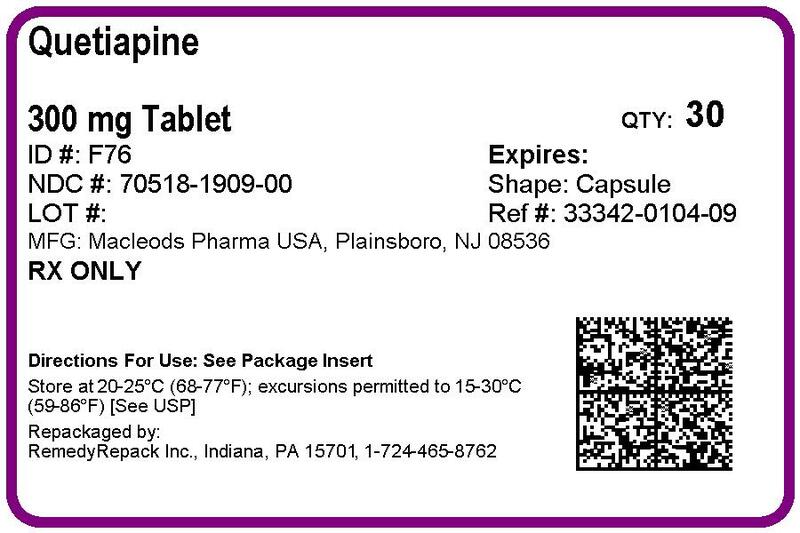 Appropriate care is advised when prescribing quetiapine for patients who will be experiencing conditions which may contribute to an elevation in core body temperature, e.g., exercising strenuously, exposure to extreme heat, receiving concomitant medication with anticholinergic activity, or being subject to dehydration. Esophageal dysmotility and aspiration have been associated with antipsychotic drug use. Aspiration pneumonia is a common cause of morbidity and mortality in elderly patients, in particular those with advanced Alzheimer's dementia. Quetiapine and other antipsychotic drugs should be used cautiously in patients at risk for aspiration pneumonia. Acute withdrawal symptoms, such as insomnia, nausea, and vomiting have been described after abrupt cessation of atypical antipsychotic drugs, including quetiapine. In short-term placebo-controlled, monotherapy clinical trials with quetiapine extended-release that included a discontinuation phase which evaluated discontinuation symptoms, the aggregated incidence of patients experiencing one or more discontinuation symptoms after abrupt cessation was 12.1% (241/1993) for quetiapine extended-release and 6.7% (71/1065) for placebo. The incidence of the individual adverse events (i.e., insomnia, nausea, headache, diarrhea, vomiting, dizziness and irritability) did not exceed 5.3% in any treatment group and usually resolved after 1 week post-discontinuation. Gradual withdrawal is advised. Doses, taken concomitantly with other anticholinergic medications, or taken in overdose. Norquetiapine, an active metabolite of quetiapine, has moderate to strong affinity for several muscarinic receptor subtypes. This contributes to anticholinergic adverse reactions when quetiapine is used at therapeutic doses, taken concomitantly with other anticholinergic medications, or taken in overdose. see Overdosage (10.1) and Clinical Pharmacology (12.1)]. fatal reports in patients who were receivingmultiple concomitant medications that decrease intestinal motility. Constipation was a commonly reported adverse event in patients treated with quetiapine and represents a risk factor for intestinal obstruction. Intestinal obstruction has been reported with quetiapine, including fatal reports in patients who were receivingmultiple concomitant medications that decrease intestinal motility. be used with caution in patients with a current diagnosis or prior history of urinary retention, clinically significant prostatic hypertrophy, constipation, or increased intraocular pressure. Quetiapine should be used with caution in patients with a current diagnosis or prior history of urinary retention, clinically significant prostatic hypertrophy, constipation, or increased intraocular pressure. Parkinsonism incidence rates as measured by the Simpson-Angus total score for placebo and the five fixed doses (75, 150, 300, 600, 750 mg/day) were: -0.6; -1.0, -1.2; -1.6; -1.8 and -1.8. The rate of anticholinergic medication use to treat emergent EPS for placebo and the five fixed doses was: 14%; 11%; 10%; 8%; 12% and 11%.In six additional placebo-controlled clinical trials (3 in acute mania and 3 in schizophrenia) using variable doses of quetiapine, there were no differences between the quetiapine and placebo treatment groups in the incidence of EPS, as assessed by Simpson-Angus total scores, spontaneous complaints of EPS and the use of concomitant anticholinergic medications to treat EPS.In two placebo-controlled clinical trials for the treatment of bipolar depression using 300 mg and 600 mg of quetiapine, the incidence of adverse reactions potentially related to EPS was 12% in both dose groups and 6% in the placebo group. In these studies, the incidence of the individual adverse reactions (akathisia, extrapyramidal disorder, tremor, dyskinesia, dystonia, restlessness, muscle contractions involuntary, psychomotor hyperactivity and muscle rigidity) were generally low and did not exceed 4% in any treatment group.The 3 treatment groups were similar in mean change in SAS total score and BARS Global Assessment score at the end of treatment. The use of concomitant anticholinergic medications was infrequent and similar across the three treatment groups. Schizophrenia: The incidence of discontinuation due to adverse reactions for quetiapine-treated and placebo-treated patients was 8.2% and 2.7%, respectively. The adverse event leading to discontinuation in 1% or more of patients on quetiapine and at a greater incidence than placebo was somnolence (2.7% and 0% for placebo). Bipolar I Mania: The incidence of discontinuation due to adverse reactions for quetiapine-treated and placebo-treated patients was 11.4% and 4.4%, respectively. The adverse reactions leading to discontinuation in 2% or more of patients on quetiapine and at a greater incidence than placebo were somnolence (4.1% vs. 1.1%) and fatigue (2.1% vs. 0).Commonly Observed Adverse Reactions in Short-Term, Placebo-Controlled TrialsIn therapy for schizophrenia (up to 6 weeks), the most commonly observed adverse reactions associated with the use of quetiapine in adolescents (incidence of 5% or greater and quetiapine incidence at least twice that for placebo) were somnolence (34%), dizziness (12%), dry mouth (7%), tachycardia ( 7%). In a short-term placebo-controlled monotherapy trial in adolescent patients with schizophrenia (6-week duration), the aggregated incidence of extrapyramidal symptoms was 12.9% (19/147) for quetiapine and 5.3% (4/75) for placebo, though the incidence of the individual adverse reactions (akathisia, tremor, extrapyramidal disorder, hypokinesia, restlessness, psychomotor hyperactivity, muscle rigidity, dyskinesia) did not exceed 4.1% in any treatment group. In a short-term placebo-controlled monotherapy trial in children and adolescent patients with bipolar mania (3-week duration), the aggregated incidence of extrapyramidal symptoms was 3.6% (7/193) or quetiapine and 1.1% (1/90) for placebo. 1There were no adverse experiences with the prefered term of dytonic or dyskinetic events. Adults: Asymptomatic, transient and reversible elevations in serum transaminases (primarily ALT) have been reported. In schizophrenia trials in adults, the proportions of patients with transaminase elevations of > 3 times the upper limits of the normal reference range in a pool of 3- to 6-week placebo-controlled trials were approximately 6% (29/483) for quetiapine compared to 1% (3/194) for placebo. In acute bipolar mania trials in adults, the proportions of patients with transaminase elevations of > 3 times the upper limits of the normal reference range in a pool of 3- to 12-week placebocontrolled trials were approximately 1% for both quetiapine (3/560) and placebo (3/294). These hepatic enzyme elevations usually occurred within the first 3 weeks of drug treatment and promptly returned to pre-study levels with ongoing treatment with quetiapine. In bipolar depression trials, the proportions of patients with transaminase elevations of > 3 times the upper limits of the normal reference range in two 8-week placebo-controlled trials was 1% (5/698) for quetiapine and 2% (6/347) for placebo. <12 g/dL females on at least one occasion occurred in 11% (2277/20729) of quetiapine-treated patients. The following adverse reactions were identified during post approval of quetiapine. Because these reactions are reported voluntarily from a population of uncertain size, it is not always possible to reliably estimate their frequency or establish a causal relationship to drug exposure. Adverse reactions reported since market introduction which were temporally related to quetiapine therapy include anaphylactic reaction, cardiomyopathy, drug reaction with eosinophilia and systemic symptoms (DRESS), hyponatremia, myocarditis, nocturnal enuresis, pancreatitis, retrograde amnesia, rhabdomyolysis, syndrome of inappropriate antidiuretic hormone secretion (SIADH), Stevens-Johnson syndrome (SJS), and toxic epidermal necrolysis (TEN), decreased platelet count, serious liver reactions (including hepatitis, liver necrosis, and hepatic failure), agranulocytosis, intestinal obstruction, ileus, colon ischemia, urinary retention, and sleep apnea. The risks of using quetiapine in combination with other drugs have not been extensively evaluated in systematic studies. Given the primary CNS effects of quetiapine, caution should be used when it is taken in combination with other centrally acting drugs. Quetiapine potentiated the cognitive and motor effects of alcohol in a clinical trial in subjects with selected psychotic disorders, and alcoholic beverages should be limited while taking quetiapine. Quetiapine exposure is increased by the prototype CYP3A4 inhibitors (e.g., ketoconazole, itraconazole, indinavir, ritonavir, nefazodone, etc.) and decreased by the prototype CYP3A4 inducers (e.g., phenytoin, carbamazepine, rifampin, avasimibe, St. John’s wort etc.). Dose adjustment of quetiapine will be necessary if it is co-administered with potent CYP3A4 inducers or inhibitors. Because of its potential for inducing hypotension, quetiapine may enhance the effects of certain antihypertensive agents. Quetiapine may antagonize the effects of levodopa and dopamine agonists. There are no clinically relevant pharmacokinetic interactions of Quetiapine on other drugs based on the CYP pathway. Quetiapine and its metabolites are non-inhibitors of major metabolizing CYP’s (1A2, 2C9, 2C19, 2D6 and 3A4). There are no adequate and well-controlled studies of quetiapine use in pregnant women. In limited published literature, there were no major malformations associated with quetiapine exposure during pregnancy. In animal studies, embryofetal toxicity occurred. Quetiapine should be used during pregnancy only if the potential benefit justifies the potential risk to the fetus. There are limited published data on the use of quetiapine for treatment of schizophrenia and other psychiatric disorders during pregnancy. In a prospective observational study, 21 women exposed to quetiapine and other psychoactive medications during pregnancy delivered infants with no major malformations. Among 42 other infants born to pregnant women who used quetiapine during pregnancy, there were no major malformations reported (one study of 36 women, 6 case reports). Due to the limited number of exposed pregnancies, these postmarketing data do not reliably estimate the frequency or absence of adverse outcomes. Neonates exposed to antipsychotic drugs (including quetiapine), during the third trimester of pregnancy are at risk for extrapyramidal and/or withdrawal symptoms following delivery. There have been reports of agitation, hypertonia, hypotonia, tremor, somnolence, respiratory distress and feeding disorder in these neonates. These complications have varied in severity; while in some cases symptoms have been self-limited, in other cases neonates have required intensive care unit support and prolonged hospitalization. When pregnant rats and rabbits were exposed to quetiapine during organogenesis, there was no teratogenic effect at doses up to 2.4 times the maximum recommended human dose (MRHD) for schizophrenia of 800 mg/day based on mg/m2 body surface area. However, there was evidence of embryo-fetal toxicity, which included delays in skeletal ossification occurring at approximately 1 and 2 times the MRHD of 800 mg/day in both rats and rabbits, and an increased incidence of carpal/tarsal flexure (minor soft tissue anomaly) in rabbit fetuses at approximately 2 times the MRHD. In addition, fetal weights were decreased in both species. Maternal toxicity (observed as decreased body weights and/or death) occurred at 2 times the MRHD in rats and approximately 1-2 times the MRHD (all doses tested) in rabbits. In a peri/postnatal reproductive study in rats, no drug-related effects were observed when pregnant dams were treated with quetiapine at doses 0.01, 0.12, and 0.24 times the MRHD of 800 mg/day based on mg/m2 body surface area. However, in a preliminary peri/postnatal study, there were increases in fetal and pup death, and decreases in mean litter weight at 3 times the MRHD. The effect of quetiapine on labor and delivery in humans is unknown. Quetiapine was excreted into human milk. Because of the potential for serious adverse reactions in nursing infants from quetiapine, a decision should be made whether to discontinue nursing or to discontinue the drug, taking into account the importance of the drug to the mother’s health. In published case reports, the level of quetiapine in breast milk ranged from undetectable to 170 µg/L. The estimated infant dose ranged from 0.09% to 0.43% of the weight-adjusted maternal dose. Based on a limited number (N=8) of mother/infant pairs, calculated infant daily doses range from less than 0.01 mg/kg (at a maternal daily dose up to 100 mg quetiapine) to 0.1 mg/kg (at a maternal daily dose of 400 mg). Safety and effectiveness of quetiapine in pediatric patients less than 13 years of age with schizophrenia have not been established. The safety and effectiveness of quetiapine in the maintenance treatment of bipolar disorder has not been established in pediatric patients less than 18 years of age. The safety and effectiveness of quetiapine in the maintenance treatment of schizophrenia has not been established in any patient population, including pediatric patients. Safety and effectiveness of quetiapine in pediatric patients less than 10 years of age with bipolar mania have not been established. Safety and effectiveness of quetiapine in pediatric patients less than 18 years of age with bipolar depression have not been established. A clinical trial with quetiapine extended-release was conducted in children and adolescents (10 to 17 years of age) with bipolar depression, efficacy was not established. Quetiapine is not a controlled substance. Quetiapine has not been systematically studied, in animals or humans, for its potential for abuse, tolerance or physical dependence. While the clinical trials did not reveal any tendency for any drug-seeking behavior, these observations were not systematic and it is not possible to predict on the basis of this limited experience the extent to which a CNS-active drug will be misused, diverted, and/or abused once marketed. Consequently, patients should be evaluated carefully for a history of drug abuse, and such patients should be observed closely for signs of misuse or abuse of quetiapine, e.g., development of tolerance, increases in dose, drug-seeking behavior. ]. One case, involving an estimated overdose of 9600 mg, was associated with hypokalemia and first-degree heart block. In post-marketing experience, there were cases reported of QT prolongation with overdose. Appropriate supportive measures are the mainstay of management. For the most up-to-date information on the management of Seroquel overdosage, contact a certified Regional Poison Control Center (1-800-222-1222). Quetiapine fumarate USP is a white to off-white crystalline powder which is moderately soluble in water. Inactive ingredients are povidone, dibasic dicalcium phosphate dihydrate, microcrystalline cellulose, sodium starch glycolate, lactose monohydrate, magnesium stearate, colloidal silicon di-oxide, hypromellose, polyethylene glycol and titanium dioxide. The 25 mg tablets contain red ferric oxide and yellow ferric oxide and the 100 mg and 400 mg tablets contain only yellow ferric oxide. 2 with similar receptor affinities may explain some of the other effects of quetiapine. 1 receptors may explain the somnolence observed with this drug. 1 receptors may explain the orthostatic hypotension observed with this drug. ], in patients with concomitant illness, and in patients taking medicines known to cause electrolyte imbalance or increase QT interval. max and AUC values increased by 25% and 15%, respectively. 14C-quetiapine, less than 1% of the administered dose was excreted as unchanged drug, indicating that quetiapine is highly metabolized. Approximately 73% and 20% of the dose was recovered in the urine and feces, respectively. Quetiapine is extensively metabolized by the liver. The major metabolic pathways are sulfoxidation to the sulfoxide metabolite and oxidation to the parent acid metabolite; both metabolites are pharmacologically inactive. In vitro studies using human liver microsomes revealed that the cytochrome P450 3A4 isoenzyme is involved in the metabolism of quetiapine to its major, but inactive, sulfoxide metabolite and in the metabolism of its active metabolite N-desalkyl quetiapine. 17% increase mean max plasma concentration at steady state. Quetiapine decreased mating and fertility in male Sprague-Dawley rats at oral doses of 50 and 150 mg/kg or approximately 1 and 3 times the maximum human dose (MRHD) of 800 mg/day on mg/m2 body surface area. Drug related effects included increases in interval to mate and in the number of matings required for successful impregnation. These effects continued to be observed at 3 times the MRHD even after a two-week period without treatment. The no-effect dose for impaired mating and fertility in male rats was 25 mg/kg, or 0.3 times the MRHD dose on mg/m2 body surface area. Quetiapine adversely affected mating and fertility in female Sprague-Dawley rats at an oral dose approximately 1 times the MRHD of 800 mg/day on mg/m2 body surface area. Drug-related effects included decreases in matings and in matings resulting in pregnancy, and an increase in the interval to mate. An increase in irregular estrus cycles was observed at doses of 10 and 50 mg/kg, or approximately 0.1 and 1 times the MRHD of 800 mg/day on mg/m2 body surface area. The no-effect dose in female rats was 1 mg/kg, or 0.01 times the MRHD of 800 mg/day on mg/m2 body surface area. 2 body surface area, respectively. Pigment deposition was shown to be irreversible in rats. The identity of the pigment could not be determined, but was found to be co-localized with quetiapine in thyroid gland follicular epithelial cells. The functional effects and the relevance of this finding to human risk are unknown. The efficacy of quetiapine in the treatment of schizophrenia was established in 3 short-term (6-week) controlled trials of inpatients with schizophrenia who met DSM III-R criteria for schizophrenia. Although a single fixed dose haloperidol arm was included as a comparative treatment in one of the three trials, this single haloperidol dose group was inadequate to provide a reliable and valid comparison of quetiapine and haloperidol. Several instruments were used for assessing psychiatric signs and symptoms in these studies, among them the Brief Psychiatric Rating Scale (BPRS), a multi-item inventory of general psychopathology traditionally used to evaluate the effects of drug treatment in schizophrenia. The BPRS psychosis cluster (conceptual disorganization, hallucinatory behavior, suspiciousness, and unusual thought content) is considered a particularly useful subset for assessing actively psychotic schizophrenic patients. A second traditional assessment, the Clinical Global Impression (CGI), reflects the impression of a skilled observer, fully familiar with the manifestations of schizophrenia, about the overall clinical state of the patient. 1. In a 6-week, placebo-controlled trial (n=361) (study 1) involving 5 fixed doses of quetiapine (75 mg/day, 150 mg/day, 300 mg/day, 600 mg/day and 750 mg/day given in divided doses three times per day), the 4 highest doses of quetiapine were generally superior to placebo on the BPRS total score, the BPRS psychosis cluster and the CGI severity score, with the maximal effect seen at 300 mg/day, and the effects of doses of 150 mg/day to 750 mg/day were generally indistinguishable. 2. In a 6-week, placebo-controlled trial (n=286) (study 2) involving titration of quetiapine in high (up to 750 mg/day given in divided doses three times per day) and low (up to 250 mg/day given in divided doses three times per day) doses, only the high dose quetiapine group (mean dose, 500 mg/day) was superior to placebo on the BPRS total score, the BPRS psychosis cluster, and the CGI severity score. 3. In a 6-week dose and dose regimen comparison trial (n=618) (study 3) involving two fixed doses of quetiapine (450 mg/day given in divided doses both twice daily and three times daily and 50 mg/day given in divided doses twice daily), only the 450 mg/day (225 mg given twice daily) dose group was superior to the 50 mg/day (25 mg given twice daily) quetiapine dose group on the BPRS total score, the BPRS psychosis cluster, and the CGI severity score. The primary efficacy results of these three studies in the treatment of schizophrenia in adults is presented in Table 19. Examination of population subsets (race, gender, and age) did not reveal any differential responsiveness on the basis of race or gender, with an apparently greater effect in patients under the age of 40 years compared to those older than 40. The clinical significance of this finding is unknown. The efficacy of quetiapine in the treatment of schizophrenia in adolescents (13–17 years of age) was demonstrated in a 6-week, double-blind, placebo-controlled trial (study 4). Patients who met DSM-IV diagnostic criteria for schizophrenia were randomized into one of three treatment groups: quetiapine 400 mg/day (n = 73), quetiapine 800 mg/day (n = 74), or placebo (n = 75). Study medication was initiated at 50 mg/day and on day 2 increased to 100 mg/per day (divided and given two or three times per day). Subsequently, the dose was titrated to the target dose of 400 mg/day or 800 mg/day using increments of 100 mg/day, divided and given two or three times daily. The primary efficacy variable was the mean change from baseline in total Positive and Negative Syndrome Scale (PANSS). Quetiapine at 400 mg/day and 800 mg/day was superior to placebo in the reduction of PANSS total score. The primary efficacy results of this study in the treatment of schizophrenia in adolescents is presented in Table 19. SD: standard deviation; SE: standard error; LS Mean: least-squares mean; CI: unadjusted confidence interval1. Difference (drug minus placebo) in least-squares mean change from baseline. 2. Doses that are statistically significant superior to quetiapine 50 mg BID. The efficacy of quetiapine in the acute treatment of manic episodes was established in 3 placebo-controlled trials in patients who met DSM-IV criteria for bipolar I disorder with manic episodes. These trials included patients with or without psychotic features and excluded patients with rapid cycling and mixed episodes. Of these trials, 2 were monotherapy (12 weeks) and 1 was adjunct therapy (3 weeks) to either lithium or divalproex. Key outcomes in these trials were change from baseline in the Young Mania Rating Scale (YMRS) score at 3 and 12 weeks for monotherapy and at 3 weeks for adjunct therapy. Adjunct therapy is defined as the simultaneous initiation or subsequent administration of quetiapine with lithium or divalproex. The efficacy of quetiapine in the acute treatment of bipolar mania was established in 2 placebo-controlled trials. 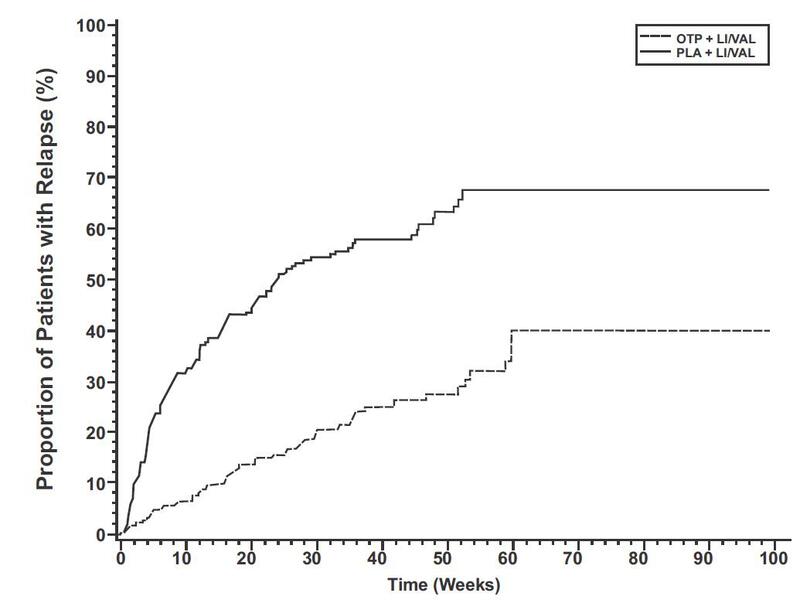 In two 12-week trials (n=300, n=299) comparing quetiapine to placebo, quetiapine was superior to placebo in the reduction of the YMRS total score at weeks 3 and 12. The majority of patients in these trials taking quetiapine were dosed in a range between 400 mg/day and 800 mg per day (studies 1 and 2 in Table 20). >20) were randomized to receive quetiapine or placebo as adjunct treatment to lithium or divalproex. Patients may or may not have received an adequate treatment course of lithium or divalproex prior to randomization. Quetiapine was superior to placebo when added to lithium or divalproex alone in the reduction of YMRS total score (study 3 in Table 20). The majority of patients in this trial taking quetiapine were dosed in a range between 400 mg/day and 800 mg per day. In a similarly designed trial (n=200), quetiapine was associated with an improvement in YMRS scores but did not demonstrate superiority to placebo, possibly due to a higher placebo effect. The primary efficacy results of these studies in the treatment of mania in adults is presented in Table 20. The efficacy of quetiapine in the acute treatment of manic episodes associated with bipolar I disorder in children and adolescents (10 to 17 years of age) was demonstrated in a 3-week, double-blind, placebo-controlled, multicenter trial (study 4 in Table 20). Patients who met DSM-IV diagnostic criteria for a manic episode were randomized into one of three treatment groups: quetiapine 400 mg/day (n = 95), quetiapine 600 mg/day (n = 98), or placebo (n = 91). Study medication was initiated at 50 mg/day and on day 2 increased to 100 mg/day (divided doses given two or three times daily). Subsequently, the dose was titrated to a target dose of 400 mg/day or 600 mg/day using increments of 100 mg/day, given in divided doses two or three times daily. The primary efficacy variable was the mean change from baseline in total YMRS score. Quetiapine 400 mg/day and 600 mg/day were superior to placebo in the reduction of YMRS total score (Table 20). 1. Doses that are statistically significantly superior to placebo. 2. Difference (drug minus placebo) in least-squares mean change from baseline. 3. Included in the trial as an active comparator. 4. Adult data mean baseline score is based on patients included in the primary analysis; pediatric mean baseline score is based on all patients in the ITT population. The efficacy of quetiapine for the acute treatment of depressive episodes associated with bipolar disorder was established in 2 identically designed 8-week, randomized, double-blind, placebo-controlled studies (N=1045) (studies 5 and 6 in Table 21). These studies included patients with either bipolar I or II disorder and those with or without a rapid cycling course. Patients randomized to quetiapine were administered fixed doses of either 300 mg or 600 mg once daily. The primary rating instrument used to assess depressive symptoms in these studies was the Montgomery-Asberg Depression Rating Scale (MADRS), a 10-item clinician-rated scale with scores ranging from 0 to 60. The primary endpoint in both studies was the change from baseline in MADRS score at week 8. In both studies, quetiapine was superior to placebo in reduction of MADRS score. Improvement in symptoms, as measured by change in MADRS score relative to placebo, was seen in both studies at Day 8 (week 1) and onwards. In these studies, no additional benefit was seen with the 600 mg dose. For the 300 mg dose group, statistically significant improvements over placebo were seen in overall quality of life and satisfaction related to various areas of functioning, as measured using the Q-LES-Q(SF). The primary efficacy results of these studies in the acute treatment of depressive episodes associated with bipolar disorder in adults is presented in Table 21. >20 at 2 consecutive assessments; or study discontinuation due to a mood event (Figure 1 and Figure 2). 50 mg: White colored, round, film coated tablets, debossed with "F 72" on one side and plain on the other side. 100 mg: Yellow colored, round, film coated tablets debossed with "F 73" on one side and plain on the other side. 200 mg: White colored, round, film coated tablets debossed with "F 75" on one side and plain on the other side. 300 mg: White colored, capsule shaped, film coated tablets debossed with "F 76" on one side and plain on the other side. Prescribers or other health professionals should inform patients, their families, and their caregivers about the benefits and risks associated with treatment with quetiapine tablets and should counsel them in its appropriate use. A patient Medication Guide about “Antidepressant Medicines, Depression and other Serious Mental Illness, and Suicidal Thoughts or Actions” is available for quetiapine tablets. The prescriber or health professional should instruct patients, their families, and their caregivers to read the Medication Guide and should assist them in understanding its contents. Patients should be given the opportunity to discuss the contents of the Medication Guide and to obtain answers to any questions they may have. The complete text of the Medication Guide is reprinted at the end of this document. Patients should be advised of the following issues and asked to alert their prescriber if these occur while taking quetiapine tablets. see Warnings and Precautions (5.10)]. Medication GuideQuetiapine Tablets(kwe-TYE-a-peen)Read this Medication Guide before you start taking quetiapine tablets and each time you get a refill. There may be new information. This information does not take the place of talking to your healthcare provider about your medical condition or your treatment. What is the most important information I should know about quetiapine tablets? Quetiapine tablets may cause serious side effects, including: 1.
risk of death in the elderly with dementia. Medicines like quetiapine can increase the risk of death in elderly people who have memory loss (dementia). Quetiapine tablets are not for treating psychosis in the elderly with dementia. Depression and other serious mental illnesses are the most important causes of suicidal thoughts and actions.Some people may have a particularly high risk of having suicidal thoughts or actions. These include people who have (or have a family history of) depression, bipolar illness (also called manic-depressive illness), or suicidal thoughts or actions. What are quetiapine tablets? Quetiapine tablets are a prescription medicine used to treat: • schizophrenia in people 13 years of age or older • bipolar disorder in adults, including: ° depressive episodes associated with bipolar disorder ° manic episodes associated with bipolar I disorder alone or with lithium or divalproex ° long-term treatment of bipolar I disorder with lithium or divalproex • manic episodes associated with bipolar I disorder in children ages 10 to 17 years old It is not known if quetiapine tablet is safe and effective in children under 10 years of age. What should I tell my healthcare provider before taking quetiapine tablets? Before you take quetiapine tablets, tell your healthcare provider if you have or have had: • diabetes or high blood sugar in you or your family. Your healthcare provider should check your blood sugar before you start quetiapine tablets and also during therapy • high levels of total cholesterol, triglycerides or LDL-cholesterol or low levels of HDL-cholesterol • low or high blood pressure • low white blood cell count • cataracts • seizures • abnormal thyroid tests • high prolactin levels • heart problems • liver problems • any other medical condition • pregnancy or plans to become pregnant. It is not known if quetiapine tablets will harm your unborn baby. • breast-feeding or plans to breast-feed. Quetiapine fumarate can pass into your breast milk. You and your healthcare provider should decide if you will take quetiapine tablets or breast-feed. You should not do both. • if you have or have had a condition where you cannot completely empty your bladder (urinary retention), have an enlarged prostate, or constipation, or increased pressure inside your eyes. quetiapine tablets by mouth, with or without food. If you feel you need to stop quetiapine tablets, talk with your healthcare provider first. If you suddenly stop taking quetiapine tablets, you may have side effects such as trouble sleeping or trouble staying asleep (insomnia), nausea, and vomiting. falls can happen in some people who take quetiapine tablets. These falls may cause serious injuries. Increases in blood sugar can happen in some people who take quetiapine tablets. Extremely high blood sugar can lead to coma or death. If you have diabetes or risk factors for diabetes (such as being overweight or a family history of diabetes) your healthcare provider should check your blood sugar before you start quetiapine tablets and during therapy. high fat levels in your blood (increased cholesterol and triglycerides). High fat levels may happen in people treated with quetiapine tablets. You may not have any symptoms, so your healthcare provider may decide to check your cholesterol and triglycerides during your treatment with quetiapine tablets. increase in weight (weight gain). Weight gain is common in people who take quetiapine tablets so you and your healthcare provider should check your weight regularly. Talk to your healthcare provider about ways to control weight gain, such as eating a healthy, balanced diet, and exercising. movements you cannot control in your face, tongue, or other body parts (tardive dyskinesia). These may be signs of a serious condition. Tardive dyskinesia may not go away, even if you stop taking quetiapine tablets. Tardive dyskinesia may also start after you stop taking quetiapine tablets. increases in blood pressure in children and teenagers. Your healthcare provider should check blood pressure in children and adolescents before starting quetiapine tablets and during therapy. low white blood cell count. Tell your healthcare provider as soon as possible if you have a fever, flu-like symptoms, or any other infection, as this could be a result of a very low white blood cell count. Your healthcare provider may check your white blood cell level to determine if further treatment or other action is needed. abnormal thyroid tests. Your healthcare provider may do blood tests to check your thyroid hormone level. trouble sleeping or trouble staying asleep (insomnia), nausea, or vomiting if you suddenly stop taking quetiapine tablets. These symptoms usually get better 1 week after you start having them. These are not all the possible side effects of quetiapine tablets. For more information, ask your healthcare provider or pharmacist. How should I store quetiapine tablets? • Keep quetiapine tablets and all medicines out of the reach of children. General information about the safe and effective use of quetiapine tablets. Inactive ingredients: povidone, dibasic dicalcium phosphate dihydrate, microcrystalline cellulose, sodium starch glycolate, lactose monohydrate, magnesium stearate, colloidal silicon di-oxide, hypromellose, polyethylene glycol and titanium dioxide. The 25 mg tablets contain red and yellow ferric oxide. The 100 mg and 400 mg tablets contain only yellow ferric oxide. This Medication Guide has been approved by the U.S. Food and Drug Administration.